†Senior Research Fellow, U. S. Public Health Service, Department of Physiology, School of Medicine. Threshold relative energy measurements have been made with monochromatic light at 10-mμ intervals between 400 and 710 mμ for threshold criteria which represent a series of visual acuities in addition to light detection. The data can be approximated by summing cone and rod sensitivities derived from earlier independent measurements of light detection by the dark-adapted eye in the fovea and the periphery. The relation between the logarithm of threshold energy and visual acuity required by the criterion of threshold has been predicted from monochromatic energy data for several broad spectral distributions of illumination and predictions are compared with empirical data. Dimensions of grating test patterns. 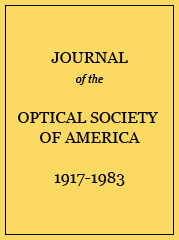 a Log relative energy thresholds for light detection and for the identification of orientation of each of three grating patterns which required visual acuities of 0.11, 0.20, and 0.33; observers JB and LP. a Each value is the average of six determinations for visual acuity and three determinations for light detection. Log relative energy thresholds for the identification of orientation of each of five grating patterns which required visual acuities of 0.09, 0.13, 0.17, 0.28, and 0.45 at each of six wavelengths. Each value is the average of six determinations; observers JB and LP.